Blattodea is an order of insects that contains the cockroaches and the termites. Formerly, the termites were considered a separate order, Isoptera, but genetic and molecular evidence suggests an intimate relationship with the cockroaches, both cockroaches and termites having evolved from a common ancestor. The Blattodea and the mantises (order Mantodea) are now all considered part of the superorder Dictyoptera. There are approximately 4,400 species of cockroach in almost 500 genera, and about 3,000 species of termite in around 300 genera. Cladistic analysis of five DNA sequences in 107 species representing all the termite subfamilies, all six cockroach families, including 22 of the 29 subfamilies, and 5 of the 15 mantis families (as out-groups) showed that the termites are nested within the cockroaches, and that the Cryptocercidae is a sister group to the termites. The mantids were shown to be the sister group to Blattodea. Cryptocercus also shares characteristics such as species of gut bacteria with the termites. The evolutionary relationships of the Blattodea (cockroaches and termites), based on Eggleton, Beccaloni & Inward (2007), are shown in the cladogram: The cockroach families Lamproblattidae and Tryonicidae are not shown but are placed within the superfamily Blattoidea. The cockroach families Corydiidae and Ectobiidae were previously known as the Polyphagidae and Blattellidae. Arthropods similar to living cockroaches dominated the insect communities of the Carboniferous era. Modern cockroaches radiated from them by the middle of the Mesozoic. This group of insects are nocturnal, only foraging for food and water at night. They are not considered eusocial because their populations are not divided into different caste systems; however, they are still social creatures and can live in groups with over a million individuals. The cockroach is flattened dorsolaterally and is roughly oval with a shield-like plate, the pronotum, covering its thorax and posterior region of the head. The antennae are many-segmented, long and slender, and the mouthparts are adapted for chewing. The forewings are normally leathery and the hind wings membranous. The coxae of the legs are flattened to enable the femurs to fit neatly against them when folded. Cockroaches are hemimetabolous; there is no pupal stage and the nymphs resemble the adults apart from their size and the absence of wings. Female cockroaches produce an egg sac known as an ootheca and can hold anywhere from 12-25 eggs depending upon the species. Some species display parenting behavior, whereas other species have nothing to do with the young. The nymph stage can last anywhere from five to seven years in some species. The main factors affecting the duration of the nymph stage are seasonal differences, and the amount of nutrients received in the diet. As in most insect species, it known that cockroaches communicate with one another by the release of pheromones. Recently, it has also been discovered that cockroaches release hydrocarbons from their body that are transferred through interactions of the antennae. These hydrocarbons can aid in cockroach communication and can even tell whether an individual is a member of its kin or not to prevent inbreeding. Cockroaches that have been isolated in a lab setting have shown extreme behavioral effects and are less stimulated by these hydrocarbons and pheromones, possibly suggesting a group environment is required for development of these communication skills. Cockroaches are believed to be vectors for many different allergens and could possibly play a large part in the development of asthma. About 60% of asthma patients in Chicago are also sensitive to cockroach allergens. Studies similar to this have been done globally and all the results are similar. Cockroaches can live for a few days up to a month without food, so just because no cockroaches are visible in a home does not mean they are not there. Approximately 20-48% of homes with no visible sign of cockroaches have detectable cockroach allergens in dust. All species of termite are to some degree eusocial and colonies are split into caste systems. The majority of termite populations consist of the worker caste which are responsible for foraging, nest building, grooming, and brood care. The soldier caste has one responsibility which is to protect the nest from predators and other competitors. Soldiers have highly developed mandibles as well as many exocrine glands that can secrete multiple defensive substances harmful to predators. Normally, only the king and queen termite reproduce; the other class are all sterile. There are two classes of reproductives: primary reproductives and neonetic reproductives. The primary reproductives class is responsible for colony creation and is characterized by compound eyes, wing marks (spots where wings once were before shedding), and defined sclerotization. Neonetic reproductives can develop from within the colony usually when the primary reproductives has died, or can develop in addition to the queen. Neonetic reproductives can experience two different phenotypes one with wings and one without. If neonetics are winged they will fly away from parental colony and form their own, however if they are wingless they will stay within the parental colony. These two different morphs are usually dependent upon food availability in the colony or increased parasitism present in colony. Later larval instars will begin to develop signs of caste differentiation. If it will become a member of the reproductives, there will be an increase in the size of the gonadal region. Termites have two main nesting behaviors that can vary by species. There are one-piece nesting termites, which live in one piece of dead wood that serves as their nest and a food source. Members of a one-piece nest never leave the colony unless they develop into winged reproductives, and the colony life is limited by food availability. There are also multiple-piece nesting termites, which is characterized by having a nest completely separate from their foraging grounds. In these nests, workers explore outside of the nest for new foraging grounds, and this allows for the colony life to not be limited by food abundance. Termites have the ability to create large and complex tunnel systems with nest that help protect them against water flowing in the ground soil, as well as protecting them against predators. These nest systems are designed to regulate the moisture level suitable for their environment. Some species have the ability to change nest architecture depending upon the temperature, humidity or loss of CO2 and can acclimate to the changing environment. Termites' nest and tunnel systems have also shown increases in soil nutrients such as ammonium and nitrate ions, and will create a more organic plant soil than surrounding areas. These systems also increase available cations (Ca++, Mg++, K+, Na+) which aid in the growth of the plant systems above these nest. This will help with above-ground plant growth and will provide a more diverse grass and plant population than surrounding areas. In Africa termite mounds are as large as 9 meters tall and 30 meters in diameter and create a small hotspot for biodiversity. It has been shown that a higher abundance of woody plants (fruiting trees and evergreens), large herbivores such as zebras and buffalos, and smaller mammals, as well as increased insect and arachnid species, can be found at or around these mounds. In the United States, termites are one of the biggest structural pests, having the ability to destroy homes, businesses, factories, and crops. Worldwide, termites account for 80% of structural pests and an estimated $22 billion is spent globally to destroy or eradicate them. In the U.S. alone. an estimated $2 billion is spent on eradication of these pest, which means these pests provide some economic value. Most termites that are considered structural pests are known to be invasive species and are believed to be transferred to different parts of the world through the lumber trade. There are currently 28 species of invasive termites and successful eradication has only occurred in two species, meaning this group of organisms is highly evolved and has the capability to travel very easily in lumber being shipped throughout the world. The largest predators to termites are ants, from the order Hymenoptera. It is believed termite population size generally depends on the population size of ant colonies in the same area. Other predators to termites include the red-back salamander. Species of centipedes have seen to feed on termites in the lab settings. Many different bird species have also been known to feed on termites, particularly in the tropics. 1 2 "Order Blattodea: Cockroaches and Termites". BugGuide. Retrieved 2015-08-27. ↑ Inward, Daegan; Beccaloni, George; Eggleton, Paul (2007). "Death of an order: a comprehensive molecular phylogenetic study confirms that termites are eusocial cockroaches". Biology Letters. 3 (3): 331–5. doi:10.1098/rsbl.2007.0102. PMC 2464702 . PMID 17412673. ↑ Djernæs, M. (2012). "Phylogeny of cockroaches (Insecta, Dictyoptera, Blattodea), with placement of aberrant taxa and exploration of out-group sampling". Systematic Entomology. 37 (1): 65–83. doi:10.1111/j.1365-3113.2011.00598.x. ↑ Eggleton P.; Beccaloni G.; Inward D.; et al. (2007). "Invited reply: Response to Lo et al". Biology Letters. 3 (5): 564–565. doi:10.1098/rsbl.2007.0367. ↑ Beccaloni G. W.; Eggleton P. (2011). "Order Blattodea Brunner von Wattenwyl, 1882. In: Zhang, Z.-Q. (Ed.). Animal biodiversity: An outline of higher-level classification and survey of taxonomic richness". Zootaxa. 3148: 199–200. 1 2 Bell, William J.; Roth, Louis M.; Nalepa, Christine A. (2007). Cockroaches: Ecology, Behavior, and Natural History. JHU Press. pp. xii, 1. ISBN 978-0-8018-8616-4. 1 2 Lihoreau, M; Costa, J.T. ; Rivault, C (2012). "The social biology of domiciliary cockroaches: colony structure, kin recognition and collective decisions.". 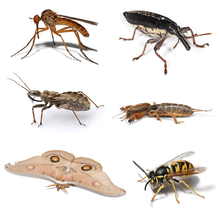 Insectes sociaux. ↑ Park, Yung Chul; Grandcolas, Philippe; Choe, Jae Chun (July 1, 2002). "Colony Composition, Social Behavior and Some Ecological Characteristics of the Korean Wood-Feeding Cockroach (Cryptocercus kyebangensis)". BioOne Online Journals. doi:10.2108/zsj.19.1133. Retrieved March 1, 2016. ↑ Eggleston, P.A. ; Arruda, L.K. (2001). "Ecology and elimination of cockroaches and allergens in the home.". Journal of Allergy and Clinical Immunology. 1 2 Rose, T.C. ; Ediger, E.F.; Lehman-Schletewitz, J; McClane, N.W. ; Schweigert, K.C. ; Alzweideh, S; Zeismann, J (2015). "Life history and development‐a framework for understanding developmental plasticity in lower termites.". Development Genes and Evolution. 1 2 3 Korb, J; Hartfelder, K (2008). "Life history and development‐a framework for understanding developmental plasticity in lower termites.". Biological Reviews. 1 2 Jouquet, Pascal; Dauber, Jens; Lagerlo ̈f, Jan; Lavelle, Patrick; Lepage, Michel (July 8, 2005). "Soil invertebrates as ecosystem engineers: Intended and accidental effects on soil and feedback loops" (PDF). Applied Soil Ecology. doi:10.1016/j.apsoil.2005.07.004. Retrieved February 29, 2016. ↑ Pennisi, E (2015). "Africa's soil engineers: Termites.". Science. 1 2 Maynard, D.S. ; Crowther, T.W. ; King, J.R.; Warren, R.J.; Bradford, M.A. (2015). "Temperate forest termites: ecology, biogeography, and ecosystem impacts.". Ecological Entomology. ↑ Evans, Theodore; Forschler, Brian; Grace, J.Kenneth (2013). "Biology of Invasive Termites: A Worldwide Review". Annual Review of Entomology.